This game changing squonk mod has all the innovation from the original single battery TOPSIDE but now offers more power and extended battery life. This hard hitting device offers 200W of regulated power and uses dual 18650 batteries. 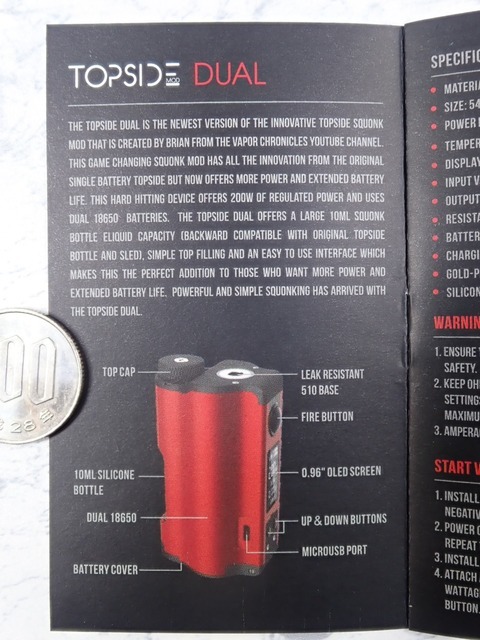 The TOPSIDE DUAL offers a large 10ml squonk bottle eliquid capacity (backward compatible with original topside bottle and sled), simple top filling and an easy to use interface which makes this the perfect addition to those who want more power and extended battery life. Powerful and Simple squonking has arrived with the TOPSIDE DUAL. 1. Ensure you use only high-drain batteries for optimum performance and safety. 2. Keep Ohm's Law into consideration when determining the optimum settings. DO NOT EXCEED your batteries' capabilities of maximum/continuous discharge rates. 1. Install 2 x 18650 High-drain batteries. Make sure the positive and negative ends are facing the correct directions. 2. Power On/Off: Click Fire Button 5 times quickly to turn the device on, repeat the process to turn the device off. 3. Install the bottle carrier into the device. 4. Attach an atomizer to the device, set your desired wattage/voltage/temperature and start vaping by pressing the Fire Button. 5. Hold both Fire Button and “-” button to enter menu. To scroll menu options, press “-” or “+” button, press Fire Button to enter sub-menu or confirm settings. 6. Hold both “+” and “-” buttons to lock the “+” and “-” buttons, repeat the process to unlock. 7. While “+” and “-” buttons are locked, press “+” button 3 times quickly to enter “Stealth Mode”. While in Stealth Mode, when pressing Fire Button, the screen will stay off. 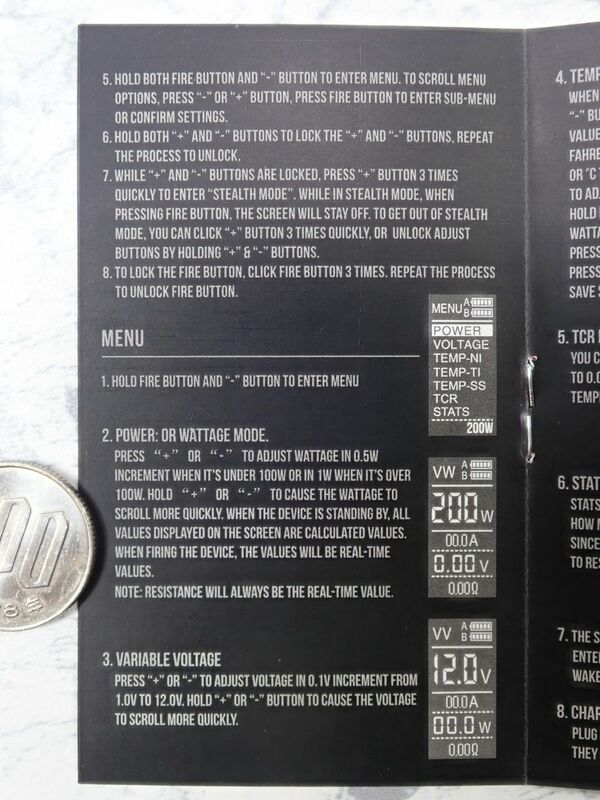 To get out of Stealth Mode, you can click “+” button 3 times quickly, or unlock adjust buttons by holding “+” & “-” buttons. 8. To lock the Fire Button, click Fire Button 3 times. Repeat the process to unlock Fire Button. 2. POWER: Or Wattage Mode. Press “+” or “-” to adjust wattage in 0.5W increment when it's under 100W or in 1W when it's over 100W. Hold “+” or “-” to cause the wattage to scroll more quickly. When the device is standing by, all values displayed on the screen are calculated values. When firing the device, the values will be real-time values. Press “+” or “-” to adjust voltage in 0.1v increment from 1.0v to 12.0v. Hold “+” or “-” button to cause the voltage to scroll more quickly. When in Temperature Control Mode, press or hold “+” or “-” button to adjust temperature. When temperature value reaches the highest/lowest point in Celsius or Fahrenheit, press “+” or “-” again to switch from °F to °C or °C to °F. To adjust pre-heat power in Temperature Control Mode, hold both Fire Button and “+” button for 1 second, wattage value will start flashing, you can adjust the wattage by pressing/holding “+” or “-” button. You can adjust TCR value from 0.00010 ( 010 on display ) to 0.00999 ( 999 on display ) for a more accurate temperature control vaping experience. STATS or statistics. 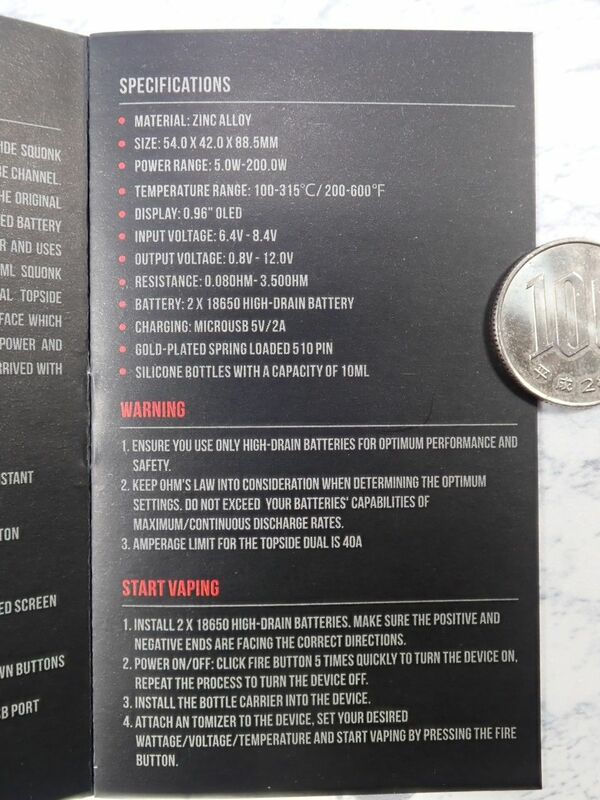 Enter the “STATS” menu, it shows you how many puffs and how much time you vaped the device since last reset. There are two options in the submenu, to reset or exit to previous menu. 7. The screen will go dim after 15 seconds of inactivity. The device will enter Sleep Mode after 180 seconds of inactivity. Press any button to wake up the device. Plug MicroUSB cable to charge the device, batteries icons will indicate they are getting filled up. 2. Short-circuit Protection: if there is a short circuit, when you press the Fire Button, the screen will display "SHORTED". 3. 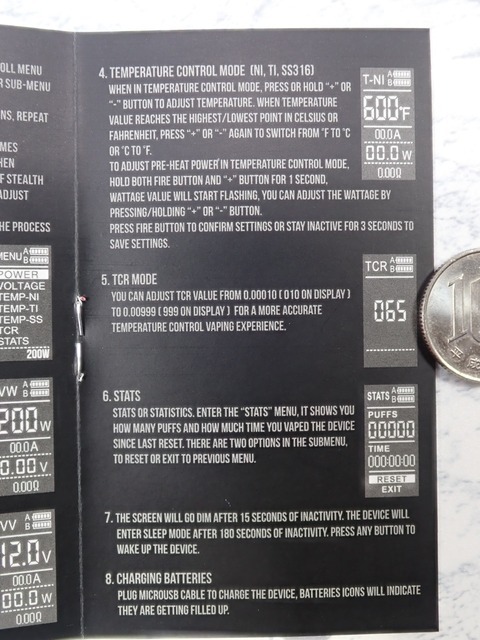 If the resistance of the atomizer is lower than 0.08Ω, when you press the Fire Button, the screen will display "LOW Ω"
4. Open-circuit Warning: if there is no atomizer attached or atomizer has an open circuit, when you press the Fire Button, the screen will display "CHECK ATOMIZER"
5. Overtime Protection: the device will cut power after 10 seconds of continuous firing, screen will display "OVER 10S"
6. 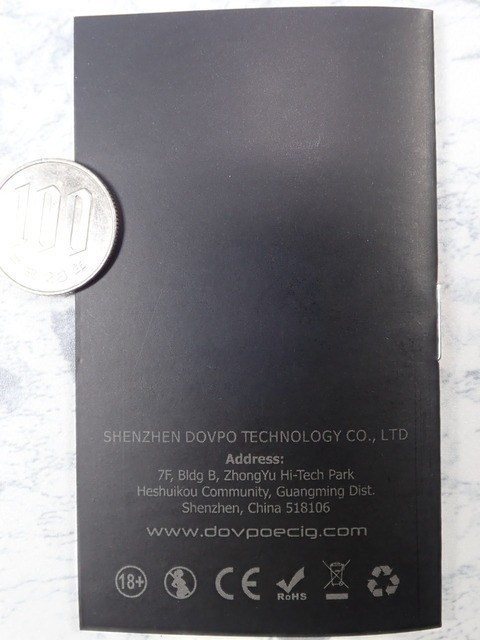 Over-temperature Protection: if the board temperature goes over 75℃/167℉, the device will cut power, when you press Fire Button, the screen will display "TOO HOT". 7. 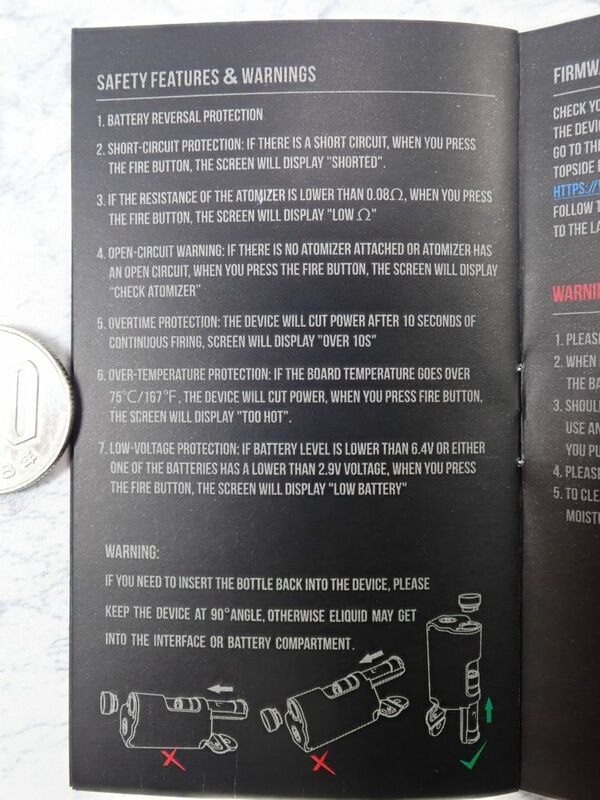 Low-voltage Protection: if battery level is lower than 6.4v or either one of the batteries has a lower than 2.9v voltage, when you press the Fire Button, the screen will display "LOW BATTERY"
If you need to insert the bottle back into the device, please keep the device at 90°angle, otherwise eliquid may get into the interface or battery compartment. Check your firmware version by holding “+” and “-” buttons for 2s when the device is off. 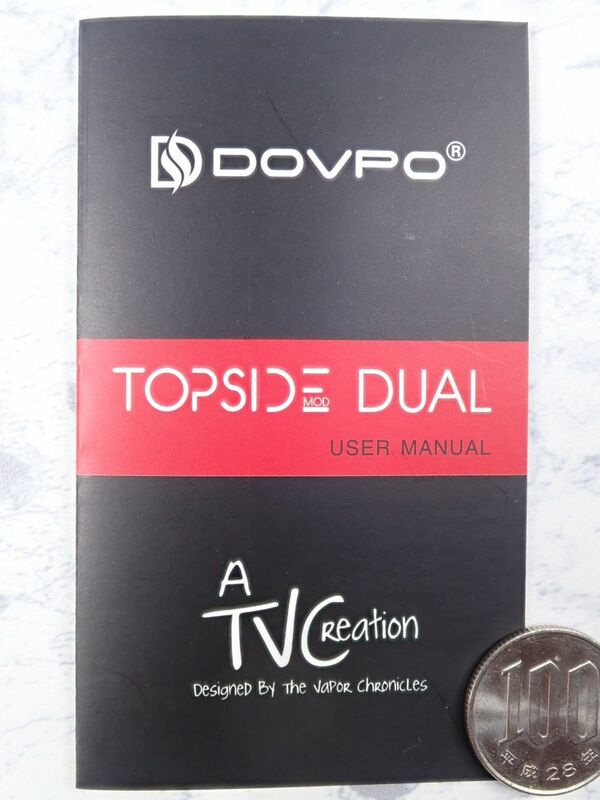 Go to the following link to check if there's an update available for your Topside firmware. 1. 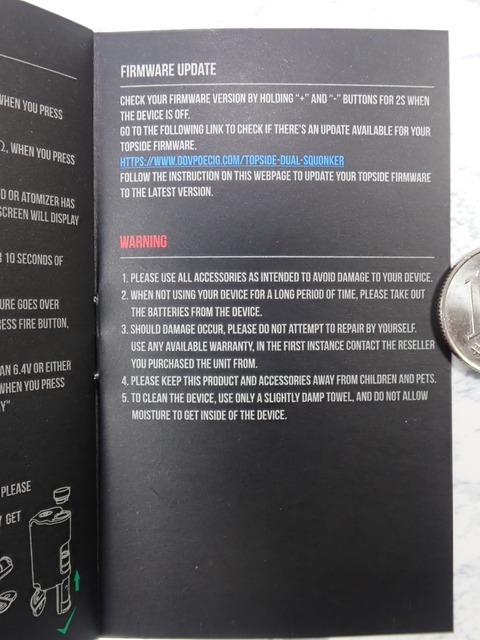 Please use all accessories as intended to avoid damage to your device. 2. When not using your device for a long period of time, please take out the batteries from the device. 3. Should damage occur, please do not attempt to repair by yourself. 4. Please keep this product and accessories away from children and pets. 5. To clean the device, use only a slightly damp towel, and do not allow moisture to get inside of the device.